It’s been a while since I’ve posted a proper Etsy haul and I have lots to share! First up was a fairly new UK based sticker shop that I’ve already made a second purchase from – Chocho and Mimi. 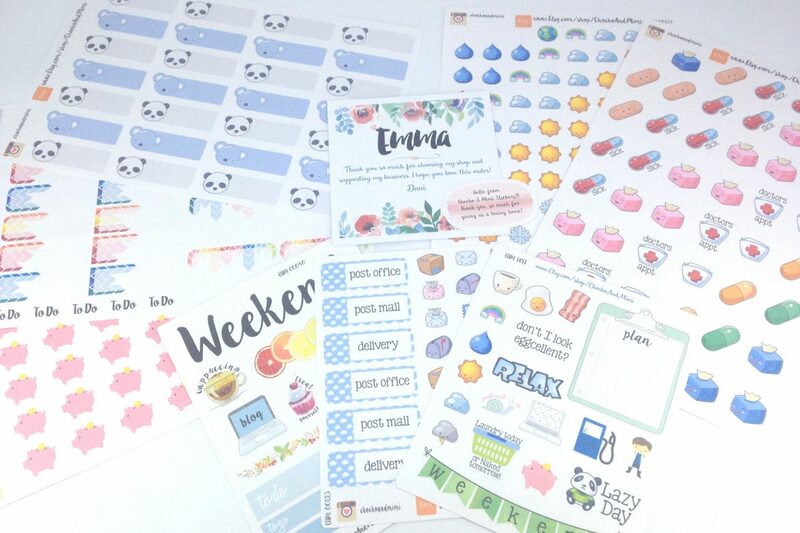 There’s a great selection of stickers in the shop, largely for Erin Condrens and other similarly sized planners but a lot of the smaller icon stickers fit nicely in my personal Filofax. These are made of paper and the colour and cuts are top notch quality. You’ll have no doubt seen these crop up in lots of my spreads already this year. The free sampler page is fab, and quite a generous size compared to others I’ve received in the past and I’ve already used a couple. Most of all I loved the personal touch contained in this order – the personalised card is pretty and different. Next up is another fairly new Etsy store – Linou’s Pots. This is another shop largely geared towards bigger planners, but I still picked a few sheets of her adorable watercolour stickers. I was impressed with how quickly they shipped and arrived. The little pink sheet was a lovely handwritten note too! Once again these stickers are beautifully printed on really thick, high quality paper. The sheet on the bottom right was a lovely freebie sheet. I’d definitely buy from here again. Given how many pretty weekly kits she has in her shop, I almost want to buy another ECLP! Finally for the sticker shops, is yet another order from Stick With Me Shop! Once again, these stickers came super quick! I’m impressed with how quick the turnaround time and shipping from Canada is. The little sheet at the front was a freebie sheet, I love the hoover sticker! I also couldn’t resist another order from Cute Things From Japan last month. Once again the items shipped quickly and beautifully! The reason I made another purchase was some amazing Disney washi that’s new in the shop… I’m always on the look out for new Etsy stores so be sure to drop a link to yours in the comments and I’l check it out!